Despite the over $20 billion invested in IT security technology* last year, countless enterprises and government agencies have fallen victim to cyber attacks of incredible sophistication and complexity. This all points to the singular resounding reality: the next generation of cyber attacks is already here. 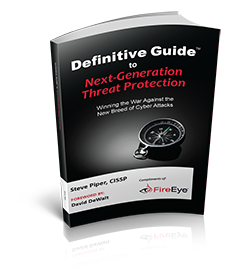 In the Definitive Guide to Next-Generation Threat Protection, Steve Piper, CISSP, dissects today's new breed of cyber attacks and how to fill the gap in network defenses in the battle against them. Today’s cyber attacks are more sophisticated than ever. In the past year, we’ve witnessed alarming data breaches of unprecedented complexity and scale, causing every CISO to re-examine the organization’s network security posture. To read more, complete the form to the right.